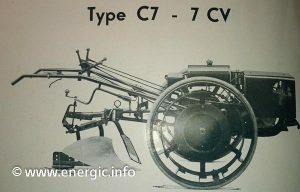 Energic motoculteur C7 B4L 7cv. 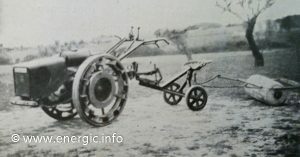 The Energic motoculteur C7 B4L replaced the type B4 5CV in 1931/2 model Type 200. Engine/Moteur. Single cylinder, enclosed side valves, 346.7cm3, 4 stroke, 7hp (cv). B4L Motobecane. Energic C7 B4L 7cv moteur after cleaning. Lubrication. Tower aided constant circulation under crankcase compression/pressure. Cooling. Two aluminium fans mounted one on each end of a cross shaft, running on ball bearings lubricated from a turn grease cup. This system draws air into the hood circulating around the engine, ensuring cooling. this system was tested in extreme high temperatures and proved effective. Air filter/Cleaner. Oil soaked metallic element. Motobecane 4BL moteur used in the C7 4BL. Gears. The three speed gear box is built within with the engine. Reverse. All three speeds are available in reverse. 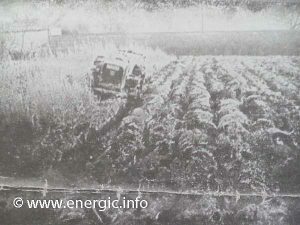 The application of reverse gear lifts the plow out of the ground. This is also used for maneuvering the motoculteur. Clutch. Multiple disc type built win with the gear box within the engine casing. Energic C7 B4L 7cv renovation project. Exhaust/Silencer. Fitted in a frontal position, away from the driver. Steering. Independent wheel clutches makes steering very easy. De-clutching one wheel, and using reverse gear allows the motoculteur to be turned in its own width without undue effort. Wheels. Outside diameter 2ft 6 ins (76,2cms) fitted with angled lugs or spuds. Three additional overall widths are available; 23ins (58,42cms), 28ins ((71,12cms) and 33ins (83,82cms). This is obtained by reversing the wheels. Energic C7 B4L 7cv with adjustable handle bars. Hitch. All implements are attached to a swinging drawbar by means of a single pin. 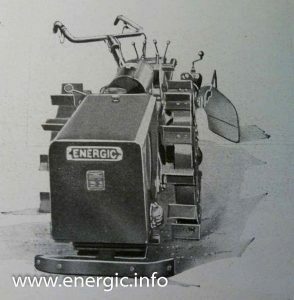 A patented devise allows the plough to work outside the motoculteurs width, maintaining the draught from the center of the motoculteur. Plowing depth. Up to 12 ins (30,48cms) dependent upon soil conditions. Fuel consumption. Four hours per gallon of petrol. or 1 hour per 1 to 1,25 liters of fuel. the tank holds approx. 9 liters. Weight. 7 1/2 cwt. Or 380kgs. Energic C7 B4L 7cv with sulky and weighted roller. Ready for rolling your lawn, bowling green, this Energic C7 B4L motobecane moteur, at 9cv was up to the mark. Just sit on the sulky and admire the view. With wide metal strip over wheels its 400kg weight was evenly distributed for minimum impact. 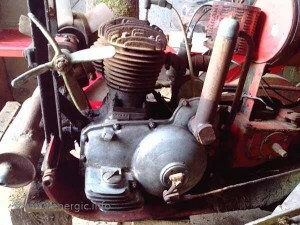 Voir restauration ici/ see a restoration in progress of a Energic motoculteur C7 4BL project Bell. 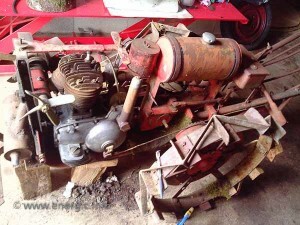 Voir restauration ici/ see a restoration in progress of a Energic motoculteur C7 4BL project Hans.